QUENTIQ AG has changed its company name to dacadoo ag – It’s all about you. QUENTIQ AG was founded in 2010 by serial entrepreneur Peter Ohnemus. 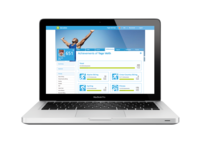 The company exited stealth mode in December 2011, going live with its first version of the online health and well-being platform. The company succeeded in attracting contracts for 85,000 paying customers in its first full year of operations in Europe in 2012. Since founding QUENTIQ AG, customer demand has driven development of the platform from a medically-themed product to a healthy lifestyle and well-being product. Reflecting this change of focus, the company decided to change its name to dacadoo. dacadoo represents a healthy lifestyle, well-being, activity and stands for the "digital rhythm of life." Through the integration of mobile telephony, group dynamics on social networks and building on the user-engagement principles of the gaming industry, dacadoo motivates users in a simple and fun way to develop their health and well-being with exercise and a healthy lifestyle. dacadoo has developed an easy-to-use, wireless, secure and fun way to manage your personal health from a lifestyle, wellness and chronic disease perspective called the dacadoo health platform. 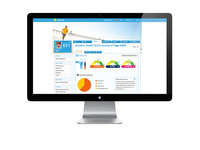 The platform calculates your personal dacadoo health score, a number from 1 (poor) to 1’000 (excellent). 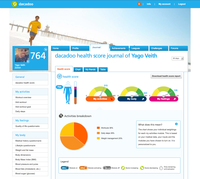 The dacadoo health score is the key indicator of your current health status. By integrating gaming and social networking principles, dacadoo motivates you to be active in an easy way by automatically tracking and comparing your personal health, fitness, lifestyle and sport. The dacadoo health score has been developed by dacadoo in collaboration with a professor and former long-term scientist at MIT in Boston. The score is based on an estimated 72 million man-years of clinical data and incorporates many of the well-known cardio and cerebrovascular risk studies in addition to dacadoo’s quality of life questionnaires. The company is currently engaging with strategic partners from the telecommunications, healthcare, fitness, media and health insurance industries to serve both corporate and private clients. dacadoo has offices in Zurich, Switzerland and in San Francisco, USA.